We all stare at our teeth in the mirror, but when biologists brush their teeth they wonder how these unusual parts of our skeletons evolved. Now, a study combining the anatomy of fossils and the genomes of modern species argues that teeth have their roots in the skins of ancient fish. New study argues that teeth have their roots in the skins of ancient fish. A new paper published this week in the journal Nature may provide an answer. Researchers at Sweden's Uppsala University and the Chinese Academy of Sciences in Beijing searched for clues in fossils of an ancient line of fish that were the ancestors of the tetrapods, and in the genomes of those species' closest living relatives. Fish have these mineralized tissues, too, but some have them in two places -- in their teeth and in spines on their skin, known as denticles. These account for the texture of shark skin, rough when stroked in one direction and smooth in the other. Between teeth and denticles, enamel presents a confusing set of clues. Modern bony fishes have teeth but no denticles, and their teeth are capped with a substance called acrodin instead of enamel. 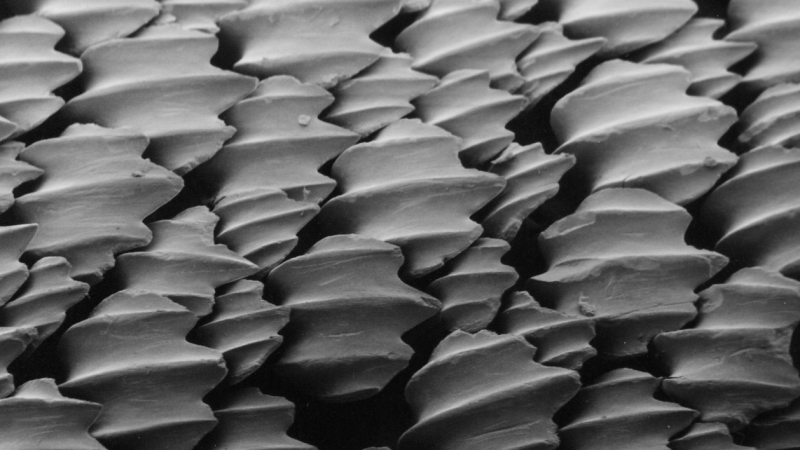 Sharks and rays, the oldest major class of living fishes, have both teeth and denticles, but they're capped with a substance called enameloid instead of enamel. Things get interesting in the handful of species between these two groups. The coelacanths, an ancient line of lobe-finned fishes related to the tetrapods, have true enamel everywhere. The paper's authors zeroed in on a primitive bony fish called the gar. Unlike other bony fish or sharks, its denticles contain an enamel-like substance called ganoin. The gar's genome, which was sequenced earlier this year, contains several of the key genes responsible for building enamel. Moreover, these genes are expressed in the skin, so the authors conclude that ganoin and enamel are the same stuff. Sharks have no such enamel-making genes, and neither do modern bony fishes. 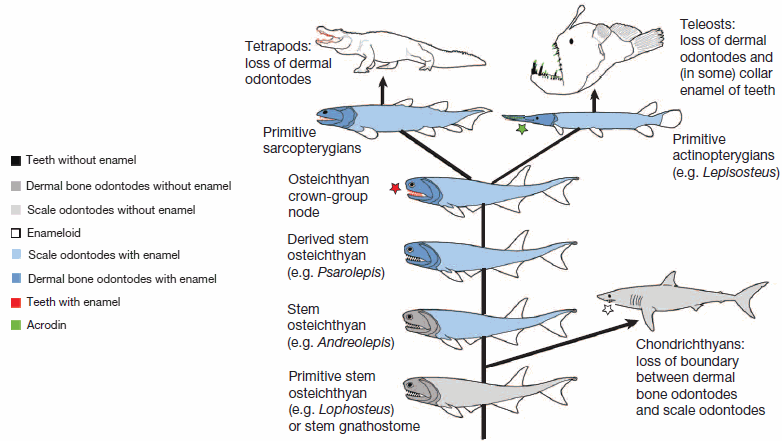 The gene evidence suggests that somewhere between the rise of sharks and the modern bony fishes, fish must have evolved and then lost the ability to make enamel while the tetrapods and coelacanths and gars retained it. Next, the researchers checked that hypothesis against the fossil record. To trace the stages in enamel evolution, they inspected fossils of three species of ancestral bony fish dating from late in the Silurian Period (about 425 million years ago). Lophosteus, a species found in Swedish rocks, had no enamel at all. Andreolepis, also from Sweden, had enamel only on the denticles behind its head, not on its teeth or head denticles. And Psarolepis, from China, had enamel everywhere but its teeth. The authors conclude that the first true enamel evolved in the skin before it spread to the head and then to the mouth. As the tetrapods evolved, climbing onto the land, they kept those enamel teeth and lost their denticles. The bony fishes lost their enamel, evolving newer tooth materials, and kept their denticles. What are denticles for? Current thinking is that they serve to streamline the skin, helping fish cut through the water. Some modern fish use them as defensive weapons, analogous to the quills of a porcupine. But once teeth arose in the earliest fish, the skin and the teeth must have gone separate evolutionary ways. 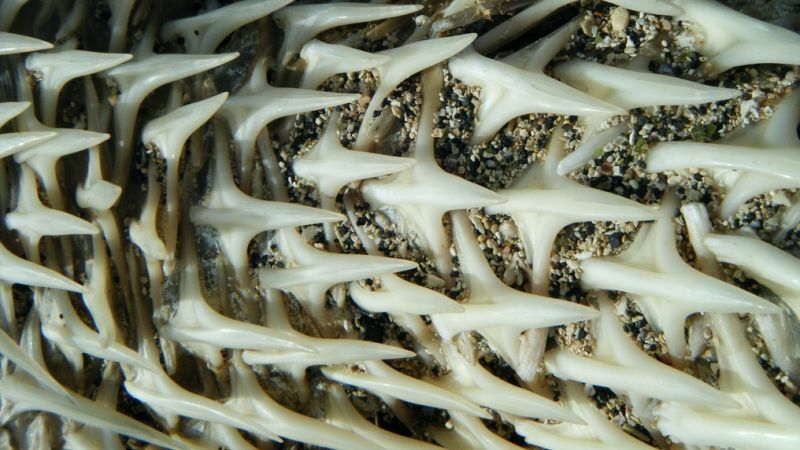 The paper's authors suggest that humans, like other tetrapods, have lost all ability to grow sharklike spines from our skins, but traces of that history may be found in our genes.